It’s a tragic story we hear too often. Last summer a couple returned from the grocery store and began unloading the shopping bags from the vehicle while their 11-month-old slept in a car seat in the back. By the time they realized the baby was missing, it was too late. She was unresponsive and later died. 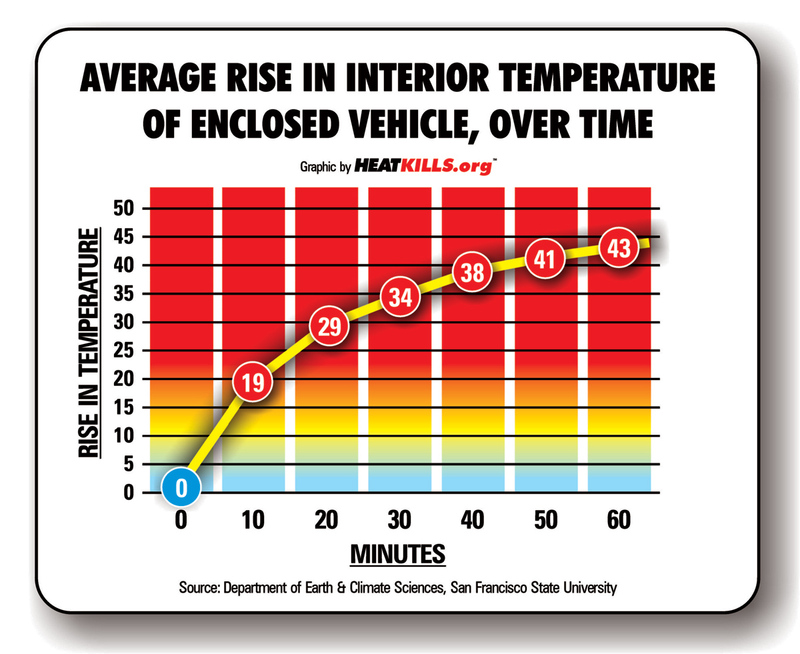 The fact is that temperatures inside a vehicle rise very quickly, so much so that the body can no longer compensate, causing heat stroke. Even on a relatively cool day, the temperature inside a parked car can quickly spike to life-threatening levels if the sun is out researchers have found. A parked car is never a safe place for a child or pet even in mild weather. Even if the car is running with the air conditioning on and the doors are locked, it’s not a safe situation. “It’s never a good idea to leave young children in the car alone. They could put the car in drive, or someone could coax the kids to unlock and open the doors,” Brad says. Open the back door and look in the back seat to assure that everyone is out of the car (even if you think you are childless). Put your cell phone, briefcase, computer, lunch, ID badge, left shoe or anything essential to your daily routine beside your child. Keep a stuffed animal in the car seat. When baby is in the seat, the stuffed animal rides shotgun. The furry passenger serves as a reminder that baby is in the back. Even if the car is in the garage, keep the doors locked to prevent curious children from getting into the car. Kids might want to play with keys and be able to get into the car without parents knowledge. If your child does not show up to daycare or school without prior notice, someone should call to locate the child. If you see a child alone in a car, do not hesitate to call 911. Sensorsafe is a technology found in some car seats from the brand Evenflo. There is a receiver that goes into your car’s diagnostics port, a socket located inside a vehicle that accesses various vehicle subsystems where small receivers can be installed to tap into a car's computer system. That receiver communicates with the car seat's smart chest clip – letting the driver know through a series of chimes whether a child is still in the seat after the car is turned off. General Motor's Rear Seat Reminder System: Some GM cars use back-door sensors that become activated when either the rear door is opened or closed within 10 minutes of the vehicle being started, or while the vehicle is running. Under these circumstances, when you reach your destination a reminder appears on the dashboard as well as an audible chime notification. Driver’s Little Helper Sensor System is a sensor system sold at several major retailers that can be put in a car seat. The sensor goes under the car seat padding where the child sits. The sensor is then attached to a battery pack and synced with an app. You can set when you want the app to send you notifications after you stop the car. You can set the interval for when you receive the notification -- the fastest being a minute. Waze, a popular traffic app, has a setting that will remind a driver to check his or her back seat when a destination entered into the app is reached. But it won’t alert a driver during an impromptu stop.